Many times an event like a wedding, funeral, speech or graduation calls for the podium to be decorated with a large floral arrangement. Make these arrangements yourself to save on the expense of a florist. It is not the preciseness of the arrangement that matters, but the size, shape and colors of the flower arrangement. 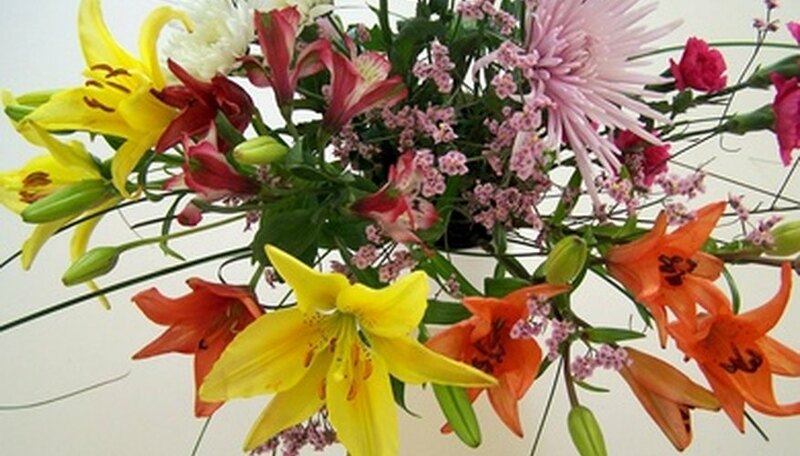 Select the flowers you are going to use to create your flower arrangement for the podium. Because the audience, or congregation, is at a distance from the arrangement, it is not as important what type of flowers you choose as the size and colors. Choose large blossoms that are on sturdy stems so they show up well at a distance. Daisies, sunflowers, mums, delphiniums, gladiolus, snapdragons, lilies, alstroemeria and carnations are good choices for podium arrangements. Pick a vase, or vessel, that is tall, with a wide mouth so it not only will support the stems of your flowers, but allow you to design an arrangement that is wide as well as tall. Add marbles or pebbles to give the vase some weight and stability. Fashion a floral foam block to fit into your vase. Make it several inches thick so your flower stems can be inserted deep enough to be stationary. Insert the floral foam and fill the vase with water that has floral preservative added to it, per the directions on the package. Insert the tallest, longest-stemmed flowers into the floral foam toward the back of your arrangement. Start at the top, but add long stemmed flowers at the sides, to create a fanned appearance. Decide whether you want your arrangement to have a rounded look or a more triangular appearance as this will decide where and how you place your flowers and greenery. A rounded look will have your flowers at similar lengths, while a triangular-shaped arrangement will have longer stems at the top and bottom, left and right, with shorter stems in between. Continue to insert your flower stems to fill in the front, sides and center of your arrangement. Cut these stems shorter so the front of your arrangement is in a dome shape with your flowers. When you have enough flowers in your arrangement, fill in between the blossoms with your greenery. Add any embellishment you want to your flower arrangement. This can be ribbons, beads, ornamental birds or items themed to the event. Keep your arrangement fresh before placing it in front of the podium by misting it with water daily and storing it in a cool place.